Since striking out on her own in 1966 after eight years as star soloist of the Caravans, Shirley Caesar has been sweeping across America and around the world, delivering her electrifying Christian messages in song and sermon, picking up 11 Grammy Awards, 18 Dove Awards, 14 Stellar Awards and numerous other honors along her journey. She has been a standard-bearer for traditional African American gospel music, yet at the same time has been unafraid to challenge conventions and take the music in daring new directions. Born October 13, 1938, in Durham, North Carolina, she was greatly inspired by her father, Big Jim Caesar, a tobacco farmer who sang with an a cappella quartet called the Just Come Four. He died of a brain seizure when she was ten. To help support her semi-invalid mother and a dozen siblings, she hit the road as a gospel soloist with a one-legged evangelist named Leroy Johnson. Billed as “Baby Shirley,” she cut her first single, I’d Rather Have Jesus / I Know Jesus Will Save, for Federal Records in November 1951. The label on the 78 r.p.m. single described her as a “12 year old lass,” although she had actually just turned 13 at the time of the recording. In 1958, Caesar put her studies at North Carolina State College and her plans to become an evangelist on hold in order to join the Caravans. The fast-rising Chicago group was missing a member when it passed through Durham. She told leader Albertina Walker that she knew all the parts and proved it. Caesar moved to Chicago and sang with the Caravans for the next eight years. 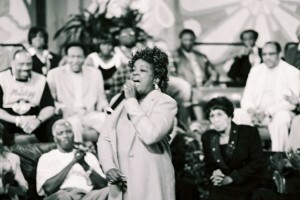 During her tenure, the group boasted other dynamic lead singers, most notably Inez Andrews and Cassietta George, but Caesar’s emotionally galvanizing delivery and highly animated stage demeanor were central in making the Caravans the most popular female gospel group since the Ward Singers. Caesar’s intense leads were featured on such hits as I Won’t Be Back (also known as Sweeping Through the City), No Coward Soldier, Holy Boldness and Choose Ye This Day. 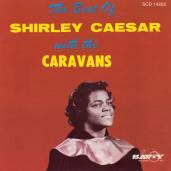 Caesar finally left the Caravans in 1966, signed with HOB Records and began appearing as “Evangelist Shirley Caesar.” Her solo saga has been a series of one triumph after another. In 1975, her gospel version of No Charge, originally a No. 1 country hit for Melba Montgomery, crossed over to both the R&B and pop charts. Three years later, First Lady, her debut for the United Artists–distributed Roadshow label, sold so well that it reached No. 36 on Billboard’s R&B album chart. Today, Caesar is one of the world’s most visible gospel singers. She has collaborated on disc with such artists as Kirk Franklin, Al Green, Whitney Houston, Gladys Knight, Patti LaBelle and Dottie Peoples, among others. She also has appeared on television on the series Good News, Soul Food and The Parkers, on Broadway in Born to Sing and This Is My Song and in the motion pictures Gospel, The Preacher’s Wife, Rosewood, Why Do Fools Fall In Love, The Fighting Temptations, The Unseen and Meet the Browns. Caesar’s plans of completing her education and becoming a minister eventually reached fruition. In 1984, she earned a bachelor’s degree in business administration from Shaw University and also spent time studying at Duke University’s Divinity School. In 1990, she was ordained as a pastor by her husband, Bishop Harold Ivory Williams, head of the Mount Calvary Word of Faith Church in Raleigh, North Carolina. She served as co-pastor with her husband until his death in 2014 and continues to lead the church and its outreach ministry. 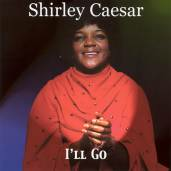 Ten of Caesar’s greatest performances with the Caravans, including I Won’t Be Back and Choose Ye This Day, can be found on the Savoy CD The Best of Shirley Caesar with the Caravans. 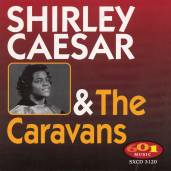 (The same tracks also appear on Shirley Caesar & the Caravans on the 601 Music label.) The CD I’ll Go consists of all 11 songs from her 1967 debut album for HOB plus three additional selections from 1968, 1973 and 1975. 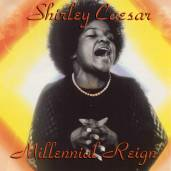 Millennial Reign is a reissue of her best-selling 1974 HOB album of the same title.